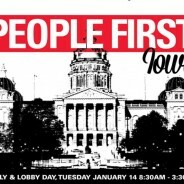 Tuesday, January 14th will be an action-packed day at the Statehouse. Check out our agenda here. 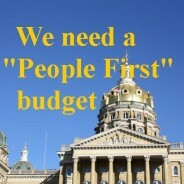 Iowa Department of Management Director David Roederer has scheduled Governor Branstad’s annual public budget hearing for 4pm Monday in the Robert Ray Conference Room of the state capitol, and Iowa Citizens for Community Improvement Action Fund (Iowa CCI Action Fund) members say they will mobilize to promote their “People First Iowa” budget and tax policies and to stand up and speak out against Branstad’s flat tax proposal and calls by corporate lobby groups to cut corporate income taxes this year. According to the Des Moines Register, federal officials are holding off on approving the Iowa Health and Wellness Plan, Branstad's proposed alternative to Medicaid expansion. 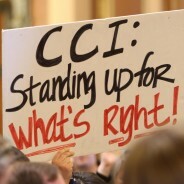 Governor Terry Branstad’s proposal Wednesday to enact an optional flat tax system would overwhelmingly benefit Iowa’s wealthiest citizens at the expense of everyday people, hardworking families, and a state budget that can afford to fully fund vital public services, Iowa Citizens for Community Improvement Action Fund (Iowa CCI Action Fund) members said Thursday. Thanks to your collective generosity, we raised over $41,838 for a people-first Statehouse and beyond. We're on a roll - thanks to CCI Action supporters, we've secured the challenge grant taking us to $14,731! CCI Action members attended a Voter ID town hall hosted by the Republicans of Black Hawk County to say "NO!" to election policy that disenfranchises everyday Iowans.